Came across the numbers of past sales (2009-2012) and estimated sales (2013-2014) for the four segments PC, Tablet, Network PC and Smartphones. To get a clearer visual I compiled them in a graph (above). Looking at the absolute numbers for PC sales shows in the grand scheme of things, they are holding up. Network PC sales are still increasing, allbeit from low absolute levels (high single digit – to estimated low double digits in 2014). Of course the story is Tablets and Smartphones. Finding plays that capitalise on those trends is what will generate added value. Contact me to discuss relevant plays. 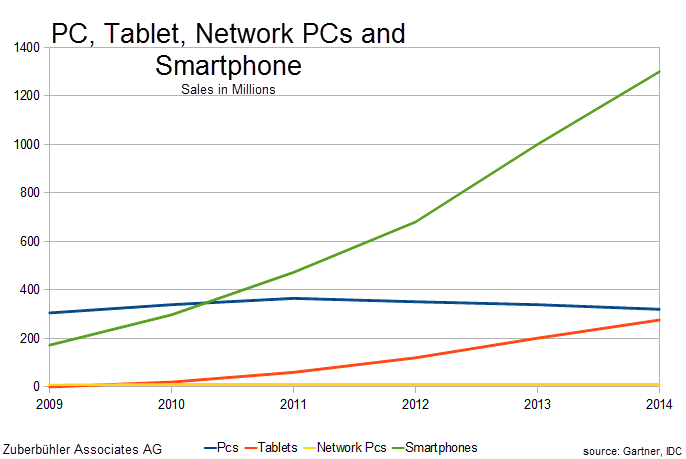 Be the first to comment on "PC vs Tablet vs Network PC vs Smartphone Sales"